Ted opened the meeting at 19:05. Each person in attendance introduced themself. Tony attended WJ'55 as a Troop Leader (Senior Scout) with the Niagara Falls District Contingent. He has been working for some time to get a commemoration of the Jamboree. He has been working with Mike Scott, Chief Commissioner and a local MP. He has agreed to approach Province of Ontario about a Provincial plaque. Tony has spoken to others about a reunion. Bruce is on the committee of Scouts Canada, Greater Toronto Council's Scout Brigade of Fort George, an annual event where about 1500 Canadian and American Scouts re-enact the War of 1812. Ron is also on the SBFG committee and was an Assistance Scoutmaster at WJ'55. George was in the St. Catherines Contingent to WJ'55. For him it was a wonderful experience. He has maintained connections life-long with the Timberlands Group of the Canadian Contingent. Bill attended WJ'55 as the Senior Patrol Leader of the 1st Colraine Contingent from Northern Ireland. The Jamboree was turning point in life. He came to Canada and made his home in Niagara area. He has memorabilia from the Jamboree. 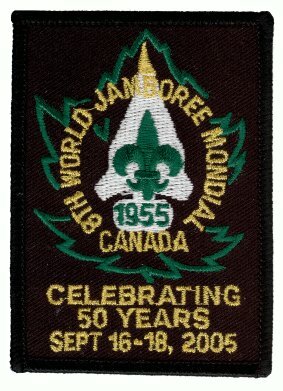 David attended WJ'55 as part of the Niagara-on-the-Lake contingent, which hiked to the Jamboree. He has an extensive scrap book and mementos of the event. Bill was a King Scout from Niagara Falls. While he did not attend the Jamboree, he felt its impact and believes that it is an important event that should be commemmorated. He is a member of the Friends of Fort George. Jack became a King's Scout in 1946 and is a friend of Bill Lindsay. Ted is a Scouter from the 11th Kitchener Scout Group in Scouts Canada, North Waterloo Area. He feels that the Jamboree is an important event that can help to promote Scouting and the life-long benefit of the Scouting experience. Liam is the Scoutmaster of the 21st Waterloo Scout Troop, also from North Waterloo Area. When visting NotL with his troop, he was surprised that he could not find any monument. Liam feels that this is an opportunity to promote Scouting in a prominent location and for attendees to hold a reunion and demonstrate the spirit of Scouting. Dave was a Scout and Rover Leader. He attented WJ'55. Ted stated that the purpose of the meeting is to create a committee that can bring together the work that various people have done towards commemorating WJ'55. By consensus Ted took the Chair, Liam meeting secretary, and Tony Steering Committee local representative. Ted will also serve as treasurer. He will use the 6th Waterloo/Scouters' Club bank account with a seperate ledger for the WJ'55 commemoration. Bill Connor has talked to Mike Scott who is looking into a Provincial plaque. Consensus was that the commitee should concentrate for now on the federal scene and on Fort George. Bill Lindsay could get a letter of support from Friends of Fort George. He has unofficial but good support from town of NotL. He tired to approach Sheila Copps through the local MP but got no response. Bill Lindsay has connection through Friends of Fort George to Ron Dale, Administrator of Fort George National Historic Site. After Discussion it was decided that the committee should take the approach that we would like a monumnet on the Fort George site. The fall back position would be to go to the Town of NotL. Bill Lindsay has good relationship with Fort George's No. 2, Buddy Andres. He arranged use of the Navy Hall venue for the meeting. He is supporting and suggested the approach to Ron Dale. There will need to be an official committment or permission from Scouts Canada. With regard to a monument, John Jupian, restoration Architecht, has been interested. He has done work for various historic sites for the Lundy's Lane Historical Society. Liam also has graphics ability and would make some draft designs. Local Artist Patricial Romance might be contacted for artistic input. Wording on a plaque should be simple and straightforward. Any plaque will have to be bilingual. Ted reported that two plaques could be made for about $1800. Attendees were very pleased with the meeting, in particular the turnout and progress made.